I get really excited when talking about service workers so I am going to go on a quick rant on the problem this solves and why this is awesome before I dive into the theory of how service workers work and a coding tutorial. If you want to jump straight to the theory or the tutorial, just go to the sections starting with titles Theory and the Application section for the code. Where are the Files Being Saved? Let’s start with a simple diagram. What do the two circles in this venn diagram represent? This is all well and good but there’s just one small problem. Without wifi their entire websites are completely unusable. Even if you just want to do simple tasks like look at product reviews for items that are already in your shopping cart, you can’t do anything. Now compare that to sites like Google Drive or Atila.ca. Atila.ca doesn’t have a million users but even when you have no internet connection, you can still use the site. Google Drive is another website that does this well. You can actually use google drive even without internet, similar to how you would use a desktop app like Microsoft Word. Learn something new everyday right? In the past it almost seemed like a truism that websites would not work without the internet. Once you realize the potential of service workers, you completely change your perspective on how you think about websites. You begin to imagine the significant user experience improvements we can have on our favorite sites. Imagine if you are on the subway commuting to work with no internet and not even any cell phone service but you could still review the product reviews of the items in your Amazon shopping cart. Or you’re on a long plane ride and while your phone is in airplane mode you can read the most popular articles from The New York Times or your favorite articles in a list that you chose to save for later. You can see that the potential is great and it easy to start daydreaming. Let’s get back to reality and dig into the theory of how this is all possible. When your internet is not working. There is no way for the browser to contact the network to retrieve the files necessary for displaying the website so it fails and you get the infamous “jumping Dinosaur” on Google Chrome. This has two very important benefits. As is mentioned in the title, this means that even when your internet connection is down, the website will still work because it never actually has to ask the internet for anything. The service worker, has all the files you will need. Conversely, this also means that even if you do have internet, the application will also run faster. On future website loads, instead of making a full round trip to the network to get the application files. It simply retrieves the files from the browser cache and serves it to the user. If you get a No NgModule error. Go to any .ts file and put a space. This is a really strange bug but you can read this Github issue for more information. In order to install the Service Worker and get access to the various Service Worker objects in our app we need to do the following. This is what turns your app from a web app to a progressive web app. It allows your web app to be more similiar to a native mobile. It allows users to install your app to their app home screen. Now we need to actually tell our app that a service worker exists. So we register the service worker module in our app module. Then we register the service worker file if our browser has service worker supportand we are are in production mode. Let’s take a look at the dist/ folder to see what building an app with service worker looks like. Recall that in the previous step we created a file called that ngsw-config.json that specified what types of files we wanted our service worker to cache and how we wanted to cache it. When the project gets built, the rules in the ngsw-config.json gets expanded to include exactly what files we will be caching. The ngsw.json file also includes a hash table to index and retrieve the cached files, the hash table also allows us to version our files so we can keep track of what versions of our file is running and if we should get a new version. Do this before going to localhost! Note that there is no wi-fi in top right. Check the devtools console: The external network resources fail with 504 but our files are succesful (200). Open the application tab in Devtools and you will see local cache section. This is the “database” where the service workers are saving your files. I believe that there are 2 tables, one which contains the actual resources our app needs and another hash table with hash keys that point to each file name, just like we saw in our ngsw.json file. That’s it! You now have a simple but fully functional offline first web app. Continue to part 2 for adding more cool features. Why are None of my APIs Working? You can see the network requests failing in your dev tools network tab. If you rebuild the project and restart server, you’ll notice that your profile doesn’t appear yet. To truly see effect of service worker we should probably deploy it to a real website. 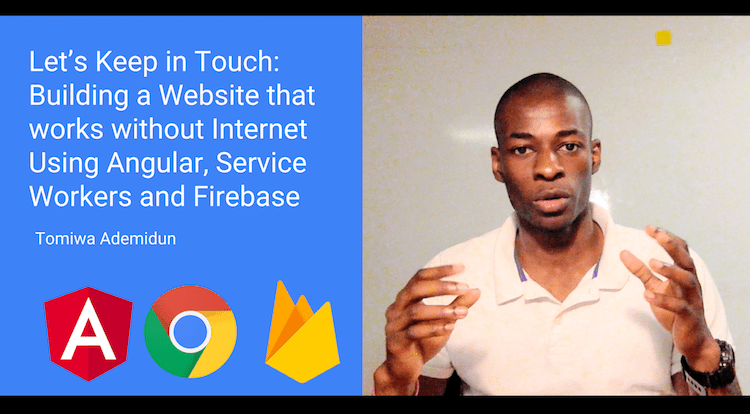 I like Firebase Hosting because you can take a web app from your local host to a live website in less than 5 minutes with just a few simple steps. I’ve been doing this for almost 2 years now and I stil get impressed with how easy the process is. That’s it! Congratulations you now have a website that can work without the internet. Most people only use the same 5 apps a day, convincing them to download another app will be very difficult. Approval and Distribution through Apple App Store and Google Play Store gatekeepers is not fun. With features like service workers I have just shown how we can enable websites to work offline, progressive web apps also enable push notifications. Native hardware features is still the one advantage which mobile apps have, though this is changing. Unless your app is mission critical to have these native features I strongly encourage startups and companies to consider looking into making their next app a progressive web app. I think that the future of the internet will see more applications distributed through browsers and urls, than native apps and the app store. In an ironic case of history repeating itself, this is actually a throwback to the advent of the internet in the 90s when companies like Netscape and various “.com”startups” were doing very well distributing their software through the web. Wouldn’t it be awesome if other sites applied that same philosophy: Imagine if you’re like me and you have a hour plus commute to work every day. Forget about wifi, they don’t even have cellular service on the subway. Now suppose I want to buy bluetooth headphones and I want to read some Amazon reviews before I make my decision. Wouldn’t it be awesome if I could cache the product details for the items in my shopping cart and read the reviews on my way to work. Then by the time I get to work, I can just buy the item I want. Imagine you’re on the plane for a quick flight from Toronto to Ottawa. You load up the NY Times to catch up on morning news but the site gives the famous “Google dinosaur”. In an ideal world, the NY Times should cache the top 5 most popular articles and let users read the articles and leave comments offline that can be synced when they connect back to the internet. Google Docs does this best. Google Docs is basically Microsoft Word, Powerpoint and Excel but better and built for Chrome. Obviously, you don’t need the internet to use Microsoft Word so just because Google Docs runs in a web browser, you should be able to use Google Docs to access and edit your recent items. Which is exactly what Google Docs does beautifully well. I feel slightly proud of the fact that the great Amazon and NY Times websites need the internet to run, but humble little Atila.ca runs just fine with and without internet 😉 When the internet is down, you can still see featured scholarships, blog posts and other pieces of content. Okay, these are mostly #FirstWorldProblems. Another thing that gets me really excited about this technology, is building internet for the next billion users. People who have very slow or inconsistent internet connection. At Atila, one of our projects is increasing access to scholarships for students from developing countries. So it would be awesome if they could seamlessly read sample essays and work on their scholarship applications even if they lived in places with poor internet connection. I personally find the idea of service workers and offline-first web applications very fascinating. Simple technologies with the ability to fundamentally change the day to day habits of billions of people are why I chose to study software engineering and why I love this field. I’m really excited to not just see how the future of the internet will unfold but also help build the future of the internet and how we will interact it. The future is already here folks, Thanks for reading.